In August 2014, Taro, in the Solomon Islands, became the first Pacific Island town to decide to relocate because of climate change. Elsewhere, 2,000 people are being resettled from the tiny islet of Han in Papua New Guinea, to mainland Bougainville, where they will be given 71 hectares for homes, schools and farming. Are these the first climate refugees? It’s likely that young people have already heard about climate change, and studies show that many young people are concerned about it, so focusing on it is also a great opportunity to help them realise what action they can take as individuals and as part of society to make positive changes. Poet Kathy Jetnil-Kijiner, from the Marshall Islands, addressed the UN Climate Summit. She read out this poem she’d written to her 7-month-old daughter – read the full poem on her blog. Activity: Pupils could watch the clip or read the poem, making a note of the negatives associated with climate change that the poet mentions, then the positive responses she suggests. Is there a place or environment they would miss, if it was lost to climate change? Years of Living Dangerously have a large database of videos linking current dialogue around migration with climate change and the impact climate change is having on the movement of people. The Guardian’s photo essay about climate refugees in Bangladesh also demonstrates the increasing danger climate changing is posing to certain communities around the globe. The earth’s climate has always been changing – we can find evidence of this through fossils, rocks and ice cores. We know that woolly mammoths roamed around England during the last ice age, and that vast forests laid down oil and coal deposits in Antarctica millions of years ago. In recent times the climate has changed more rapidly. Since 1880, global temperatures have risen by nearly a degree Celsius, and nine of the 10 warmest years on record have been since 2000. There’s a strong and growing consensus that these changes will also cause rising sea levels, the melting of polar ice sheets, more severe flooding, hurricanes and desertification. These changes – and those which are predicted over the next 80 years – are considered to be mainly as a result of human behaviour rather than due to natural changes. There’s also agreement that climate change will affect poor countries more than richer ones. 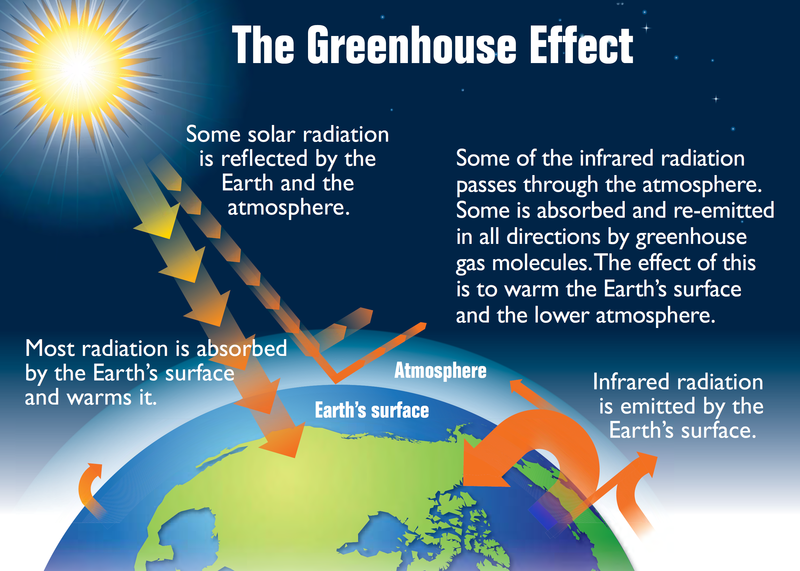 The main cause of current changes is the “greenhouse effect”. When “greenhouse gases” like carbon dioxide and methane are released into the air, they trap the sun’s heat better than other gases, and make the Earth warmer. Of course a certain amount of greenhouse gases help keep our planet warm enough for life to survive, but recently the amount has increased very quickly. Carbon dioxide levels in the atmosphere are at their highest for 650,000 years and growing steadily. Carbon dioxide is released when we burn fossil fuels in cars, for electricity or for manufacturing. Methane is also important – for instance, nearly 15% of greenhouse gases come from methane from cows, sheep and other livestock burping or farting! Why teach about climate change? Climate change touches on a range of subjects including Science, and Geography. It can spark debate, and create the impetus for whole-school involvement and student-led action for change. Climate change is something that affects the whole planet, including all people and all environments, and we cannot ignore it. Addressing our impact on the planet is an issue for every individual and every government. Young people need to have the knowledge, skills and values to be able to question the world around them, and to be able to make positive decisions to protect the planet for themselves and future generations. It’s no easy task, but luckily there are plenty of sources of support and guidance available. A good starting place is the links to teaching resources and information in this Guardian article from March 2014, on How to teach… Climate Change. KS3: students should “understand how human and physical processes interact to influence and change environments and the climate; and how human activity relies on the effective functioning of natural systems”. KS2 Living things and their habitats: Pupils should be taught to recognise that environments can change and that this can sometimes pose dangers to living things. KS3 Physics; Energy: through this topic students can explore some of the ways in which the world can reduce greenhouse gas emissions and become ‘carbon neutral’. KS3 and 4: Climate change is a rich topic for critical thinking, encouraging students to debate how countries can best come together to meet the challenges, who should take a lead, or the roles of government versus individuals (ensuring they are “equipped with the skills to think critically and debate political questions”). It’s also an opportunity for participation and volunteering, by investigating what action students can take at school and at home and then leading on projects and activities to reduce their carbon footprint and adopt a sustainable lifestyle as they grow up (so that students “develop an interest in, and commitment to… responsible activity, that they will take with them into adulthood”). KS1-4: “Living in the wider world” gives students the opportunity to use critical thinking skills to investigate the issues that affect them and others, and to become productive members of society with a respect for the environment. Focusing on climate change provides lots of opportunities for cross-curricular project work and whole school action, bringing together the science, maths and geography of our climate with students taking a lead on peer-to-peer learning and taking real steps to reduce their carbon footprint with links to creative arts, growing and cooking local food, active citizenship and aspects of PSHE. The teaching resources listed below will have suggestions, but here are a few to begin with. Pupils could find out about school recycling – is there an effective policy, is everyone following it? Where does school food come from? Are local suppliers used? What about using recycled paper and toilet paper and so on…? This can link into ‘pupil voice’ and the activities of the school council, see for example this Climate Conscious Schools case study – or it can be taken forward as part of a school partnership project, such as this ‘Whose World?’ case study. The UK has agreed targets to reduce greenhouse gas emissions – our ‘carbon footprint’ – with both the United Nations and the EU, and made a legally-binding promise to take action. The Carbon Plan aims to cut the UK’s greenhouse gas emissions by 80% by 2050 through energy efficiency, using renewable energy sources like solar and wind, and other changes, and with help from industry and individuals. Changes like this will also have to happen in many countries. Our planet is relying on a generation of students in school all over the world right now, to make the transition to a low carbon society and help secure the future for them and their peers around the world. The Carbon Trust has tools and advice to help schools measure and lower their carbon footprint. Solar Schools supports schools raising money for solar power installation. Run on Sun is Friends of the Earth’s campaign to make it easy for schools to run on solar power. Sustainability and Environmental Education (SEEd) supports educators to help students live a more sustainable life, with resources, training and sharing good practice. The Science Museum’s Climate Changing site focuses on on the science of our climate, what might happen in the future and how it could affect everyone’s lives. ActionAid has case studies enabling learners to investigate the effects of climate change on children around the world: Solomon’s Story and Climate Heroes. Oxfam’s Sow the Seed resource explores the impact of climate change on farmers around the world. PowerDown from ActionAid is a multimedia resource for geography, citizenship and science which takes learners on a journey to: learn, investigate and act on climate change. My2050 is a simulation game and schools toolkit exploring how the next generation can meet the challenge of reducing carbon emissions. The Guardian’s Climate Change website has overview, maps, opinion pieces and more that can help build students’ critical thinking skills. For more in-depth analysis you can find presentations, charts, reports and statistical data on the website of the Intergovernmental Panel on Climate Change (IPCC).